Hello! It's Saturday so that means it's time for another great sketch from The Sweet Stop! Since summer arrived this week I thought I'd make a "summer" card! It's the season for picnics and cookouts so I thought this was the perfect image to use. Make sure you stop by and check out what the other Sugar Babies have created with this awesome sketch. Thanks for stopping by and have a great weekend!! What a great summer card!! Even though I don't want ants anywhere near my picnic, these ones would be OK!! Love your red checked paper and the the doily edge!!! Thanks for your blog visit too! What a fantastic "ants" stamp! The color theme looks awesome, also! Aww, this is So CUTE!! Love the sweet little ants having a picnic! Miss Janice! I so Love WS images, and this one is no exception! 8-) I just might have to break down and get that one! 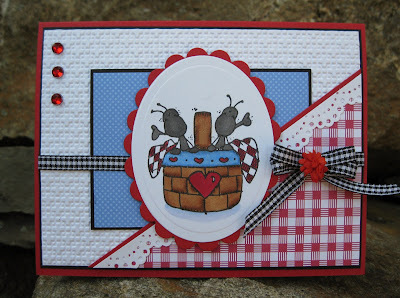 lol Love the summery dp's and fun embossing you paired with these little cuties too! Awwwww...this is too cute, Janice! Love the country look of the red gingham. These ants are adorable, but I don't want ants coming to my picnic! LOL! Have a fabulous weekend, my friend! Keep cool! This is just as cute as can be! LOVE the sketch and your image is super adorable! Darling card Janice. Love the cute image. Great coloring and colors. The textured background looks nice. The scallop border piece looks pretty on the red and white DP. I love this!! That image is way too cute and the colors and textures make the perfect summer card. Have a wonderful week!! This is SOOOO SWEET! Love the birdy theme!!! Have a blessed day!